"Holy CRAP. Is that ME?" Have you ever seen a 20-foot tall Weimaraner? Olive and I have. Last night in our backyard. Actually, our sideyard. The elusive beast materialized when I shone the flashlight on Olive and it created a 2-story tall silhouette against the side of the clay-colored house. I immediately think, “If Olive had pants on, she’d about crap in them right now. At least we’re in the yard.” This shadow was so imposing it looked like Godzilla. Especially since there are giant electrical towers snaking through this beautiful farmland serving as a backdrop. Olive takes note of the shadow immediately. Her head snaps around like a socket wrench to get a better look. To my surprise, instead of fleeing faster than a Wal-Mart shoplifter, she defies expectations and crouches down in the “play bow” position. With her rump pointing to a passing satellite, her tiny tail looks like an antenna pulling down transmission signals. This dog is such an enigma. 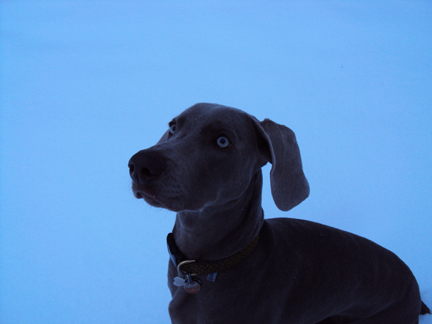 She runs away from noises as soft as parakeet farts, but she wants to engage a 20-foot shadow that looks suspiciously like another Weimaraner. Maybe she thought she was bowing to the Grand Duchy of Weimar. I wonder what she’d do if I shined the flashlight on a passing cat? What a cool little outdoor movie that would make. Giant dog and cat shadows projected against the house under a moonlit sky.